I use both Windows and Ubuntu Linux. One of the features I miss in Nautilus file manager under Ubuntu is the "Copy as Path" menu item which is available in Windows explorer context menu by holding the Shift key while right-clicking on a file or folder. 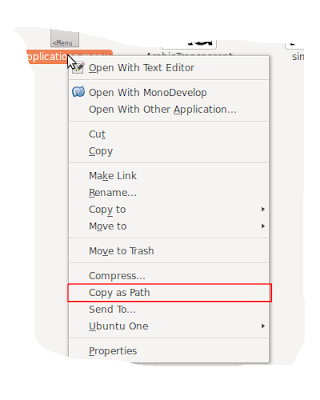 This script uses gtk Clipboard to copy the path of the file, which is passed as the second parameter, the first is the script itself. 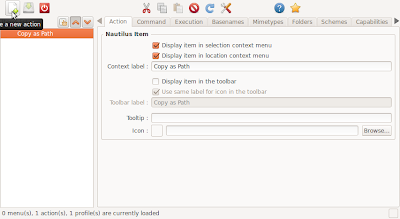 Use Nautilus-Actions to add the menu item that will invoke the script. In the Command tab, enter python for the Path, and "/path_to_script/script_name.py %f" in the Parameters text box (replace with your own values, where you saved the script). Note that the %f parameter means the selected file or folder path. 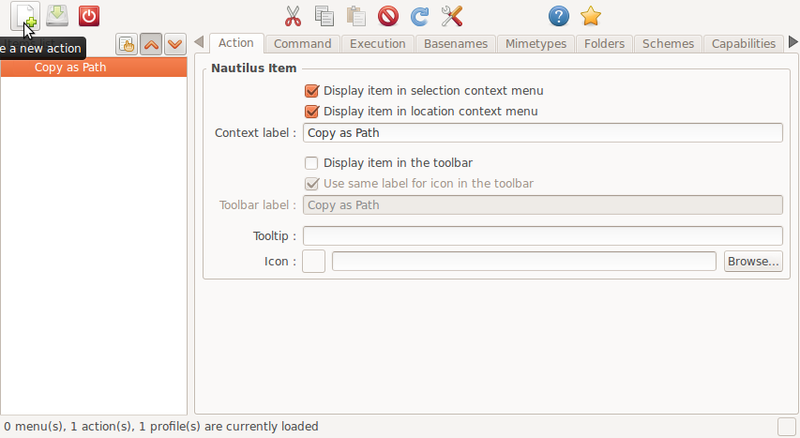 By default, Nautilus Actions creates a sub menu, and adds the custom actions to it. I did not like this behavior, which can be changed from the preferences by un-checking: "Create a root 'Nautilus-Actions' menu". This simple tweak saved me a lot of time ! I don't see the need for this in Ubuntu. You can just copy the file. When you paste into a text editor it will paste the path. Yes, but it does not work nice with terminal. (file://) is added. Also, the demonstration of the concepts is what matters. This makes attaching files in mutt much easier - thank you. Saves a lot of time for mee to.